As soon as the 2016 Sinquefield Cup ended, America’s top five players headed to Baku, Azerbijan, for the 42nd Chess Olympiad. The United States usually fields a formidable team, but this year is unprecedented, with three of the five teammates ranked in the top 10 in the world. Gone are the days when Russia, the perennial favorite for international competition, outranks other teams by a landslide. Team America, captained by International Master John Donaldson and coached by GM Alex Lenderman, is seeded second to Russia by just three rating points and is widely considered the favorite to take top honors. St. Louis resident and U.S. Champion Fabiano Caruana leads the team from board one. Hikaru Nakamura, coming off an impressive victory at the 2016 Paris Grand Chess Tour, holds board two. 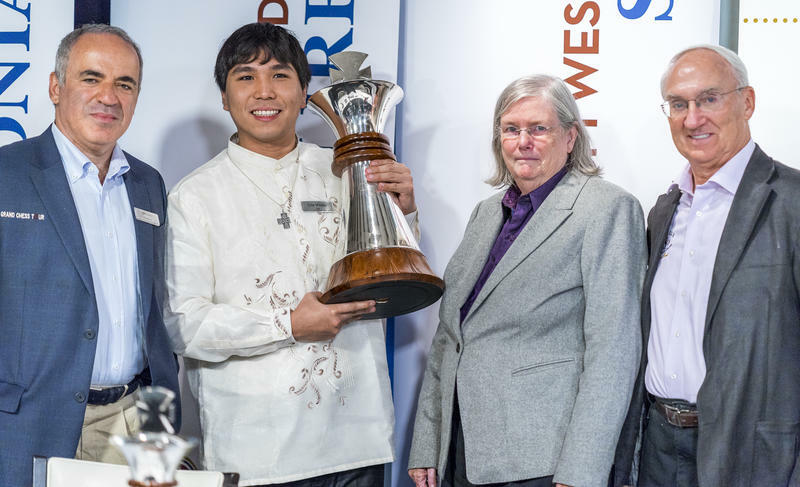 The 2016 Sinquefield Cup winner, Wesley So, outclasses many opponents on board three. Rounding out the team on board four is Sam Shankland, who readers may recall won a gold medal at the last Olympiad. Finally, St. Louis’ second member of the team, Webster University student Ray Robson, is a tough opponent for anyone. The tournament started last week, and with the first five rounds behind them, the U.S. is in excellent shape to find themselves in the winner’s circle. The Americans started strong by sweeping Andorra 4-0. Round 2 was another win for the “good guys,” who gave up only one draw to beat Scotland 3.5 - 0.5. In Round 3, the U.S. team faced strong opposition from Argentina whose players have an average rating of 2600. The U.S. won 3-1 with Nakamura putting up a stubborn defense in his game against GM Mareco, forcing his opponent to make some crucial mistakes to draw the game. The competition heated up in round four, but the Americans were able to keep an even 2-2 split with a very balanced and powerful team from the Czech Republic, led by GM David Navara. Each of the four games ended in a draw. Finally, the U.S. team bounced back from that draw to defeat Serbia 3-1. Thanks to another impressive performance by GMs So and Nakamura, the team went into the rest day with a solid standing among the other teams. Today, the U.S. team will be facing the Ukrainians for Round 6, the leader in the standings thus far. Thumbing their nose at Putin, the Ukraine has been playing amazing chess, defeating both Russia and China - world top leaders in the sport. For the Americans to comfortably maintain chances for a gold medal, they must beat Ukraine today. As it stands, the U.S. is tied for fourth place, but with four rounds still left to play, the race to the podium is still in their hands. Nakamura and So have been playing exciting chess, and of the 20 games played, the U.S. team hasn’t suffered any losses. As the men’s team fights for gold at the Chess Olympiad, so does the U.S. women’s team, led by GM Irina Krush on Board 1, current U.S. Women’s Champion, IM Nazi Paikidze on Board 2, IM Anna Zatonskih on Board 3 and WGM Katerina Nemcova on Board 4. Like the men’s team, the women’s team is in contention to win a medal with 8 out of 10 points. The women also won their first match 4-0 against a team from Tajikstan and have been seeing brilliant chess from Boards 3 and 4, not to mention the sublime performance from their reserve player, Sabrina Foisor. Today, the women’s team will be facing Turkey in Round 6. Overall, the Chess Olympiad is promising for the U.S. teams. With continued strong performances from the top players and their fourth boards and reserves, the result will see some heavy metal returning home. The last day of the Chess Olympiad is next Wednesday, Sept. 14. GM Varuzhan Akobian immigrated to the U.S. in 2001, and it didn’t take him long to make an impact on the American chess community. Within his first three years, Akobian had been awarded the prestigious Samford Chess Fellowship, tied for first in the 2002 World Open, won the Irme Koenig GM Invitational, and dominated the 2003 U.S. Junior Closed Championship after winning his first seven games. He was officially awarded the GM title in June 2004, after which he won the World Open again, clinching it with a sparkling win against Alexander Shabalov. Akobian is in frequent rotation as the Resident Grandmaster at the Chess Club and Scholastic Center of Saint Louis, and his best accomplishment is as the U.S. Championship runner-up in 2014. On Chess is provided by the Chess Club and Scholastic Center of Saint Louis. In addition to a place for enjoying chess, the Chess Club and Scholastic Center of Saint Louis is an educational institution doing work both inside the club and in the community. It is now gearing up for a record year of providing high-quality chess programming to St. Louis area schools. This academic year will be a watershed, not only because of the unprecedented scope of the program’s reach, but also because chess instruction will be an in-curricular offering in nearly 10 schools in the St. Louis Public School District. I've had the pleasure of knowing Jeffery Xiong since he started taking his first pawns. 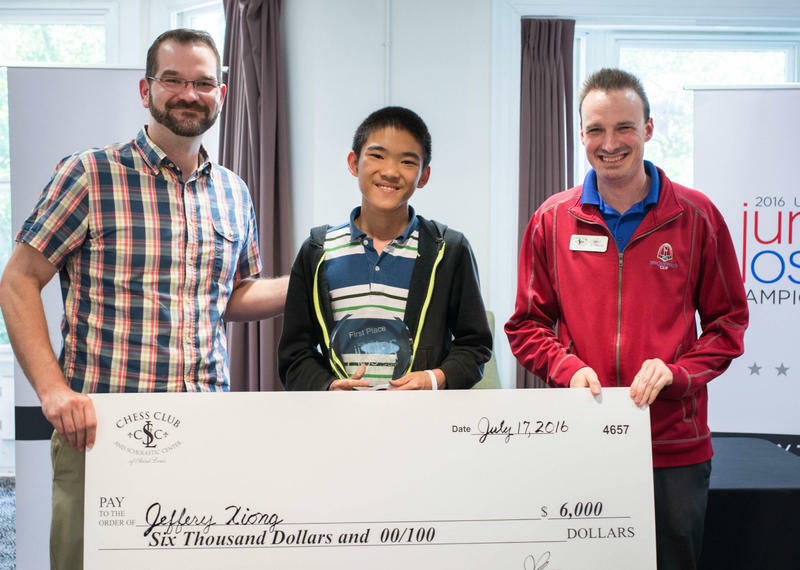 Jeffery is the current rock star of the junior chess world, having last week won the World Junior Championship in Bhubaneswar, India. The tournament brought together the strongest players from around the world age 20 or younger, and it was the 15-year old grandmaster from Coppell, Texas, who achieved the remarkable. It was the first time in 19 years that the title went to an American - already quite notable. However, and perhaps most impressive, Jeffery is the youngest player in history to have won this title. Lennart Ootes | Chess Club and Scholastic Center of Saint Louis. The third leg of the Grand Chess Tour, the 2016 Sinquefield Cup, took place at the Chess Club and Scholastic Center of Saint Louis from Aug. 4-16. With the first edition taking place just four years ago, the Sinquefield Cup has expanded from four players to include 10 of the world’s best. Furthermore, the cup joined other elite events around the world in 2015 to create the Grand Chess Tour. As usual, the tournament featured the top players in the world, as well as a wild card, giving an opportunity to a talented player who otherwise would not have made it by rating.